← Pumpkins and comics and beer, oh my! Friends, I think it’s safe to say I may have gone a little bit overboard since last we spoke. All of those notebooks in that picture? Yeah…I own them. And in the case of the orange (Expedition) one, I bought three packs of them. They’re too cool not to buy all of those! Okay, let me back up and explain. 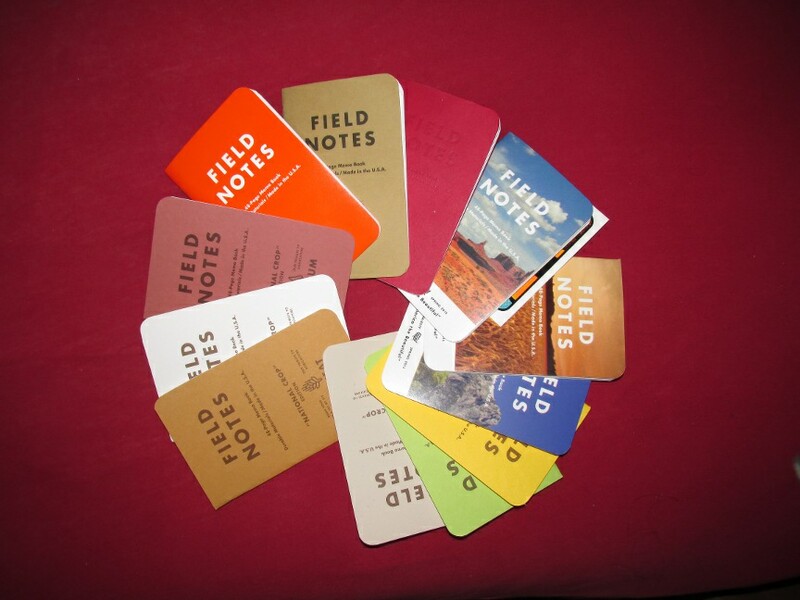 Field Notes (http://www.fieldnotesbrand.com) is a small, independent manufacturing company with their distribution offices in Chicago. They make notebooks. Not big, massive ones that you can write a whole novel in. No. These are small, 48-page, pocket-sized notebooks, perfect for your jeans pocket or shirt pocket (or lab coat!). They all have a little ruler on the inside back cover, for added convenience. They’re also well-made, with high-quality paper that (so far) takes ink really, really well. I’ll tell you why: Because I’m an obsessive nerd. Seriously. That’s why. Every so often (about 5-6 times a year) they put out a limited edition variant (the standard is a rough brown cover with black ink) that usually sells out within a month or so. Some of them last longer than others, like the US Crops edition or the myriad “County Fair” covers. My personal favorite so far? The “Expedition.” Bright, neon orange on the front and inside cover, black on the back, with a map of Antarctica ghost-printed on the outer cover. The neatest part? It’s not actually made of paper. It’s plastic. Specifically, it’s extruded polyethylene. This means that you can drop it in water and all that little notebook will do is laugh. It will mock that water like it’s nothing. Rain? Sleet? Hail? Seawater? Most chemicals? This notebook scorns them all. For me, as a chemical engineer who spends a lot of time in the lab at work, that’s amazing. It’s also amazing for going on hikes and writing stuff down. Doesn’t matter what the weather is, my notes will be fine. There, you see? I just spent a whole paragraph talking about why a notebook is awesome. I’m a huge nerd. But it’s ok, because I write about stuff with my nerdiness to help you fine people find awesome things to use. That’s cool, right? In all seriousness, though, I have no problem paying a few bucks more for something that’s going to last longer and serve me better than a cheaper alternative. This goes for all tools, from my woodturning equipment to my notebooks and pens. PS: You can tell if a pen/pencil is for left-handed folks if the writing is right-side up when you hold it in your left hand. If it’s upside-down, you’ve got a boring old right-hander’s pen. This entry was posted in Inebriated Introspection and tagged Field Notes, geek out, nerdiness, notebooks, the reason I don't have any money. Bookmark the permalink.